The journey to day +100! As I mentioned in an earlier post, when I was discharged from the hospital on day +22, i.e. twenty-two days after the donor's stem cells were infused into my blood stream, I was hardly the picture of health. In fact, so much so that for a few weeks afterwards you could be forgiven for thinking that I was actually a zombie: I'd lost about a stone, even though there wasn't much on me to start with; I rarely made a sound, except to grunt something to indicate yes or no; and I moved around quite awkwardly, due to a mixture of feeling weak and tired. Now that I think about it, I could have easily landed a part as a zombie in The Walking Dead, if it wasn't for the slight issue that even if you danced around in front of me, I had neither the energy nor appetite to chew your flesh! 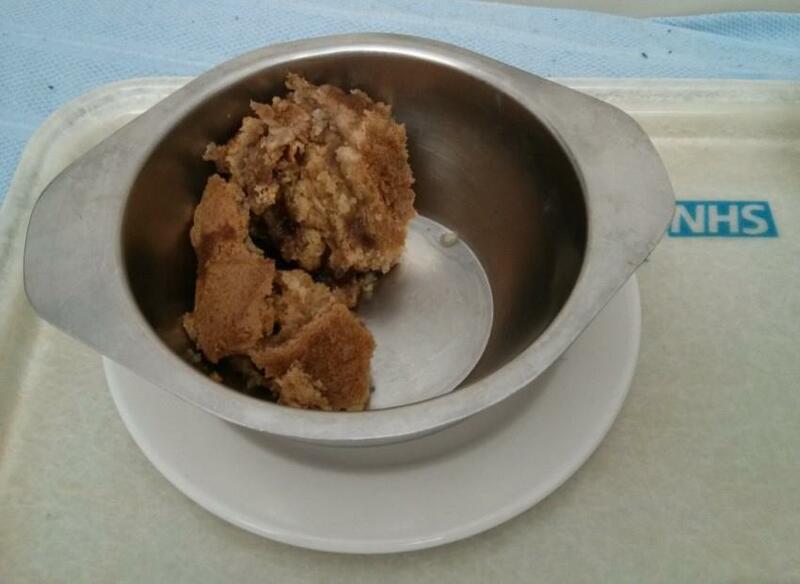 To be fair, whilst the NHS could certainly do to work on their food presentation skills (including donating those dog bowls to an animal shelter), some of the food was actually alright. For example, you might not believe it, but once I put some icecream on that Jam Roly Poly even it could nearly be described as nice. The main problem that I actually had with the hospital food was that, by the time it made it from the canteen to my room, anything that was supposed to be hot tended to be lukewarm at best. As you might imagine, when you're feeling nauseous, it is especially important that food both looks appetising and tastes nice, otherwise you won't eat much of it, and you'll likely get to taste what you do eat twice! That was partly why I was glad to get discharged, i.e. so that I could eat what I wanted, whilst it was still at the right temperature. I must admit, even at home, it took some time for my appetite and taste to come back, and I'm still avoiding certain foods now just because the last time that I had them was in hospital, and the idea that they might just taste like that again is enough to turn my stomach. That reminds me, in the early days after being discharged, I was still sick on a couple of occasions, as excess stomach acid was a problem, especially when laid down; I actually got some more pillows just so that I could sleep slightly sat up. It wasn't long after being started on Co-trimoxazole tablets (an anti-biotic) that my neutrophil count began to drop, thereby increasing my risk of infection. This is a common side effect of Co-trimoxazole, so I was simply switched to a monthly dose of Pentamidine instead. The Pentamidine is administered using a nebuliser, i.e. a gadget that enables aerosolised drugs to be inhaled into your lungs, whilst you just breath in and out normally through its mouthpiece. It takes about twenty minutes for the Pentamidine dose to be administered; You can tell when it's finished by simply looking at the air coming out of the nebuliser's mouthpiece, as if it's misty, there is still some of the drug left to inhale. I should also mention that, immediately prior to the Pentamidine, another drug is administered using the nebuliser to help open the airways (much like an asthma inhaler) - It only takes about five minutes for that drug to be administered though. The switch from Co-trimoxazole to Pentamidine did help, as my neutrophil count recovered, albeit towards the bottom-end of the normal range. On day +28, a sample of my blood was taken for chimerism testing, i.e. calculating the percentage of the genetic profiles that represent the donor and myself. The results of my first chimerism test took about two or three weeks to come through, as it's apparently a fairly involved process, and they showed that I was 98% donor. The doctor seemed really pleased with 98%, given that it had only been about a month since the donor's stem cells had been infused; Above 97% is considered to be full chimerism. Interestingly, at full chimerism, should my donor leave some of his blood behind at a crime scene, and DNA testing be performed on it, then both my donor and myself would look equally guilty if our blood was DNA tested for comparison. With that in mind, I better hope that my donor is well behaved, and I should probably hang-up my hat as a serial killer, as after the donor kindly went through the stem cell harvesting process to potentially cure my Hodgkin's Lymphoma and save my life, it would be cruel to punish that good deed with him serving several life sentences for my crimes! Note: In reality, it would seem that the DNA testing issue is not as likely to arise as you might first think, as whenever I see DNA samples being collected on TV they do so with mouth swabs. This is significant, as whilst the donor's blood and mouth swabs would show the same results, the recipient's blood and mouth swabs would differ, as only their blood would match that of the donor. Of course, this really just means that the recipient is unlikely to look guilty of the donor's crimes, as their mouth swabs won't match the donor's blood. However, the donor isn't so lucky, as they would still look guilty irrespective of how the DNA samples were collected! As I've mentioned previously, the donor and myself have different blood groups (I'm B- and the donor is A-), but eventually I'll switch to the donor's blood group - Hopefully soon! Unfortunately, a side effect of the switching process is that my hemoglobin level has been continually going up and down like a yo-yo, as I've been having red blood cell transfusions to raise it and the battle of the blood groups has been lowering it. That's meant that: I've sometimes been quite anemic, which has resulted in me feeling out of breath on any kind of exertion; and it was necessary to spend several hours on a number of occasions waiting for the blood to arrive and then for it to slowly work its way into my veins through the hickman line. As you may remember, my platelet count was in the teens when I was discharged, i.e. well below even the bottom end of the normal range. The hope was that in the coming weeks/months it would climb its way up to normal levels, but so far it hasn't changed that much, as whilst it has been in the low thirties it was only in the mid twenties when last tested. I did also need a platelets transfusion recently, as the characteristic red dots that appeared on my feet and lower legs indicated as much. The hope now is that the routine bone marrow biopsy scheduled for day +102 will shed some light on the situation, e.g. is the bone marrow failing to produce enough platelets or are they being killed off further downstream. As soon as I was started on Ciclosporin to suppress my immune system, my magnesium levels dropped a fair bit outside of the normal range. This is a common side effect of Ciclosporin, as it is known to affect the ability of the intestines to absorb magnesium. Unfortunately, that meant every few days I needed an infusion of magnesium, which took about two hours each time. I could have taken magnesium tablets instead, but they tend not to work very well in such circumstances, so given that I was already at the hospital it was easy to just hook-up some magnesium to my hickman line. For the last few weeks, I have actually managed with magnesium tablets, and more recently nothing at all, as my absorption of magnesium soon improved once my dose of Ciclosporin was reduced. I have also sometimes needed calcium and/or potassium supplements in the last couple of months, but I'm currently only in need of the calcium ones. From day -1 to day +88, I was on Ciclosporin (the immune suppressant). For most of that period, my dose was continually monitored and adjusted to try to maintain a level of 150-250ng/ml in my blood stream, but for the last few weeks the goal was instead to gradually taper off the dose, hopefully leading to stopping it altogether, providing that no issues with Graft Versus Host Disease (GVHD) were encountered. It seems that I'm very sensitive to Ciclosporin, as even when discharged on day +22, I was only taking 60mg per day, which was much less than what other patients seemed to be typically taking. My dose was later reduced to 50 and then 40mg per day, before finally beginning the tapering down to 20 and then 10mg per day, and eventually stopping it altogether. Fortunately, at day +95, I'm yet to notice any real signs of GVHD. 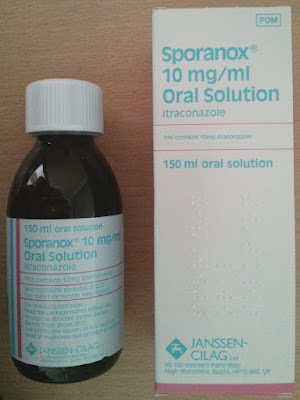 You would be forgiven for thinking that stopping the Ciclosporin was a huge relief, but it was really overshadowed by at the same time stopping the Itraconazole, or as I like to call it torture in a bottle. I had been taking that particular anti-fungal medicine twice per day since day -7, and the English language is simply not equipped to describe how truly horrible it tastes. I've not looked-up the science behind how Itraconazole works, but it wouldn't surprise me at all if it actually just scares fungal infections away. They could probably use twice daily doses of Itraconazole to replace waterboarding, and see better results! It would also have the advantage of providing protection against fungal infections, as lets face it if you're being tortured, your accommodation is probably far from that of The Ritz! After a warning like that, it only seems fair to provide a photo (see below) of one of the many Itraconazole bottles that I've had to work my way through in the last few months, as (if nothing else) if your doctor ever prescribes you it, you know what exactly it is that you need to run away from. Joking aside, you would think that, with all of the modern technology etc that we have these days, someone at the pharmaceutical company could spend a bit of time to make the product taste alright. If the scientist that developed it had to actually drink it, I'm sure the situation would soon be resolved. That pretty much covers the journey to date, which is actually slightly short of the day +100 milestone mentioned in this post's title, so that really just leaves one question: What's next? As I mentioned above, I'm still going for weekly check-ups etc, and I do have a bone marrow biopsy booked for day +102. Also of interest though is that I have a PET-CT scan arranged for day +105, and a review of the results scheduled for day +110, so in a couple of weeks I should have a better idea of how everything is going. Note: I actually also need to attend a dental appointment on day +112, but it's only for a post-treatment check-up. It is kind of amusing though, as after numerous cancer treatments, which have literally cost the NHS hundreds of thousands of pounds, the first cost that I'll incur myself is for these pre and post treatment dental check-ups!